Pierogies are half-moon shaped dough pockets that are stuffed with mashed potatoes and other ingredients such as cheese, sauerkraut and vegetables. Common pierogi preparations include boiling, sauteing and deep frying. Pierogies can be high in fat; the fat content depends on how the pierogies are cooked, the size of the pierogi and what they are stuffed with. However, pierogies can also be a healthful addition to your diet. A serving of four pierogies contains 190 to 210 calories. The calories and fat rise if the pierogies include higher-fat cheese varieties or meats such as bacon. A pierogi that is stuffed with mashed potatoes or potatoes and cheese has 1 to 2 grams of fat, which is quite low. A healthy meal plan gets only 20 to 35 percent of its daily calories from fat. If you follow a 2,000-calorie diet, this equates to 44 to 78 grams of fat per day. Perogies are a good source of carbohydrates due to the dough and the mashed potatoes in the dish. Consuming four pierogies introduces 40 to 41 grams of carbohydrates into your diet. This is a considerable amount of the 225 to 325 grams your body needs for energy and to keep your kidneys functioning. You also take in 2 to 4 grams of fiber in each serving of pierogies. Boost your fiber intake further by using whole grain flour when you're making pierogi dough. You should consume 28 to 34 grams of fiber per day. Include four pierogies in your meal plan and you'll consume 7 grams of protein. The amount of protein in this dish increases if you include bacon or other meats in the filling. 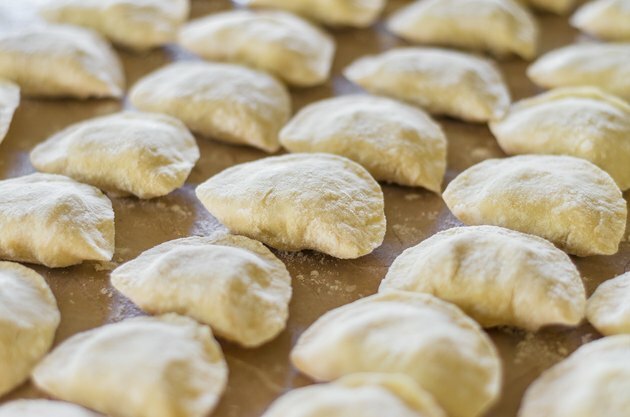 If you have light protein needs -- 50 grams stands as the lower end of the average person's daily protein needs -- the amount in pierogies satisfies a significant portion. The protein in pierogies boosts your ability to heal body tissues. Eat a serving of pierogies to boost your iron intake. Each four-pierogi portion delivers 15 percent of the daily recommended intake of this mineral. The iron in this dish helps transport oxygen throughout your body, which influences the amount of energy available to you. Pierogies also provide calcium. A serving of pierogies stuffed with potatoes and onion contains 2 percent of the amount you require, while pierogies stuffed with potatoes and cheese have 15 percent of the recommended daily amount of calcium. This mineral promotes strong bones.